Mary meeting her Son is the most painful of all the Stations of the Cross for a mother. What can be worse than watching a dear one suffer and be helpless in the face of that intense suffering? The Holy Mother of God shared in her Son's Passion and Death. So, we are asked at some point to do the same and enter into the suffering of Christ. This is different than suffering the consequences of our own sins. This is extra. This is gift. This is entering into Love. It is better to carry cheerfully, with joy, the cross or crosses which Christ has given you than to take on crosses. Only do more penance with the advice of a priest, a good traditional priest. Giving up chocolate is great, but living without the comfort of a family and accepting the joy of being criticized may be your Lenten Way. A TLM priest recently told me not to take on extra things, as poverty and being alone without a community or mate were crosses to be endured in joy and peace in my life. He is right, of course. One has a tendency to fight suffering instead of giving in to it. For, even if it is inevitable, one needs to make an act of wilful acceptance. Pray for acceptance for the crosses in your life. These might be isolation, misunderstandings, lack of love, illness, grief. God invites us to carry His Cross with Him. What an honour What a gift. You may be one of those He is asking to carry His Cross this very day, this Lent, for the rest of your life. I can think of one dear friend of mine who has a great cross to bear because of one mistake in his life. If I pray for him, I enter into his suffering and that of Christ. So it is with us. But, once we have been purged of sin, Christ invites us again to be with Him and share in His suffering. This was clear to me when I accepted having cancer. Suffering with peace and even joy is possible. Do not waste suffering, or run away from suffering. 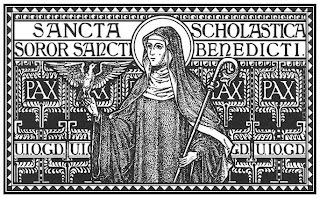 I follow too many calendars, but today, Febuary 10th, happily most of the calendars agree on the feast day of St. Scholastica, the sister of St. Benedict. Here is her story about the storm from the Pope, St. Gregory the Great. From Gregory the Great (c. 540-604), Dialogues , Book II ( Life and Miracles of St. Benedict ). Courtesy of the Saint Pachomius Library. from this website: http://www.osb.org/gen/scholastica.html and murals location are listed under the photographs. CHAPTER THIRTY-THREE: Of a Miracle Wrought by his Sister, Scholastica. 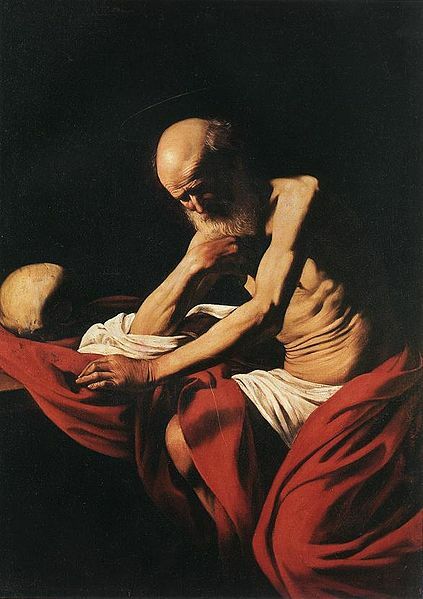 GREGORY: Who is there, Peter, in this world, that is in greater favor with God than St. Paul? Three times he petitioned our Lord to be delivered from the thorn of the flesh, and yet he did not obtain his petition. Speaking of that, I must tell you how there was one thing which the venerable father Benedict would have liked to do, but he could not. 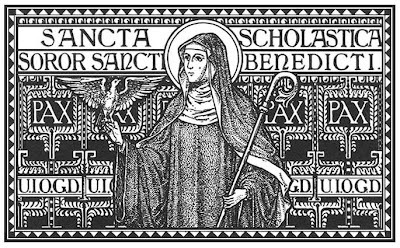 His sister, named Scholastica, was dedicated from her infancy to our Lord. Once a year she came to visit her brother. The man of God went to her not far from the gate of his monastery, at a place that belonged to the Abbey. It was there he would entertain her. Once upon a time she came to visit according to her custom, and her venerable brother with his monks went there to meet her. They spent the whole day in the praises of God and spiritual talk, and when it was almost night, they dined together. As they were yet sitting at the table, talking of devout matters, it began to get dark. The holy Nun, his sister, entreated him to stay there all night that they might spend it in discoursing of the joys of heaven. By no persuasion, however, would he agree to that, saying that he might not by any means stay all night outside of his Abbey. At that time, the sky was so clear that no cloud was to be seen. The Nun, hearing this denial of her brother, joined her hands together, laid them on the table, bowed her head on her hands, and prayed to almighty God. Lifting her head from the table, there fell suddenly such a tempest of lightning and thundering, and such abundance of rain, that neither venerable Benedict, nor his monks that were with him, could put their heads out of doors. The holy Nun, having rested her head on her hands, poured forth such a flood of tears on the table, that she transformed the clear air to a watery sky. After the end of her devotions, that storm of rain followed; her prayer and the rain so met together, that as she lifted up her head from the table, the thunder began. So it was that in one and the very same instant that she lifted up her head, she brought down the rain. The man of God, seeing that he could not, in the midst of such thunder and lightning and great abundance of rain return to his Abbey, began to be heavy and to complain to his sister, saying: "God forgive you, what have you done?" She answered him, "I desired you to stay, and you would not hear me; I have desired it of our good Lord, and he has granted my petition. Therefore if you can now depart, in God's name return to your monastery, and leave me here alone." But the good father, not being able to leave, tarried there against his will where before he would not have stayed willingly. By that means, they watched all night and with spiritual and heavenly talk mutually comforted one another. Therefore, by this we see, as I said before, that he would have had one thing, but he could not effect it. For if we know the venerable man's mind, there is no question but that he would have had the same fair weather to have continued as it was when he left his monastery. He found, however, that a miracle prevented his desire. A miracle that, by the power of almighty God, a woman's prayers had wrought. Is it not a thing to be marveled at, that a woman, who for a long time had not seen her brother, might do more in that instance than he could? She realized, according to the saying of St. John, "God is charity" [1 John 4:8]. Therefore, as is right, she who loved more, did more. PETER: I confess that I am wonderfully pleased with that which you tell me. CHAPTER THIRTY-FOUR: How Benedict Saw the Soul of his Sister Ascend into Heavenly Glory. GREGORY: The next day the venerable woman returned to her nunnery, and the man of God to his abbey. Three days later, standing in his cell, and lifting up his eyes to heaven, he beheld the soul of his sister (which was departed from her body) ascend into heaven in the likeness of a dove. Rejoicing much to see her great glory, with hymns and praise he gave thanks to almighty God, and imparted the news of her death to his monks. He sent them presently to bring her corpse to his Abbey, to have it buried in that grave which he had provided for himself. By this means it fell out that, as their souls were always one in God while they lived, so their bodies continued together after their death. First eleven posts on the Doctors of the Church in the perfection series. Obviously, not in chronological order. More to come.